Fabulous tour. Alejandro was knowledgeable and accommodating. Great car and good driver. He found us a wonderful authentic restaurant for lunch. Overall a great day, Highly recommended. TOUR GUIDE RESPONSE: Dear Karen & Friends, Thank you very much for your kind comments. I'm glad to know you enjoyed my tour no matter this was shortly on each site visited, because your ship has early departure. I look forward to see you soon in Cabo paradise. Hasta pronto Amigos! TOUR GUIDE RESPONSE: Dear Gloryvette+David & Friends, Thank you for rating my tour and your kindness enjoying our time. I looking forward to see you soon in Cabo. Hasta muy pronto amigos! We enjoyed this tour of Todos Santos guided by Alejandro. He picked us up at our hotel (Paradisus) in a very nice van and drove us to Todos Santos on nice paved roads with a rest stop. He explained history and geography. He gave us a nice walking tour of the town. He accommodated all of our special needs/requests (like lunch at a nice local restr.) . We found Alejandro very easy to talk with - we learned so much through his eyes and experience. We certainly recommend him as a guide. Our tour was fantastic! Way more than I had ever imagined. This was our first private tour with a guide and we did not know what to expect. Upon meeting Alejandro at the meeting spot it was like meeting an old friend. He kept in touch with me prior to our meet up and arrived on time and never once made us feel rushed. We felt we had VIP service with many of the galleries he took us too and the tequila tasting was an added bonus!!! Our farm dinner was so magical, we couldn't have asked for a better day!! TOUR GUIDE RESPONSE: Dear Sara, I really appreciate your comments, it was a pleasure to me and enjoyed our time with your lovely family. I look forward to see you soon next time in Cabo area. Haste la vista Amigos! My husband and I enjoyed our tour with Alejandro very much! We told him that we were celebrating our 40th wedding anniversary in Cabo, and he included a red rose, and informed the restaurant at lunch, so that they brought us complementary flan with our names written in a sweet wish on the plate. Alejandro shared very informative information about the area and drove us to both Cabo San Lucas (nice glass-bottom boat ride out to the arch) and to San José del Cabo. He is a very accommodating, wonderful guide! Alejandro gave us a very wonderful experience in Cabo. He was especially great with my elderly in laws who were first time in Cabo. We were on a cruise and this beats any excursion the cruise line can offer. Alejandro was an amazing guide. He accommodated to my family's desires and needs, easily adjusted the itinerary, and was very personable and knowledgeable. We all really enjoyed our time with him and recommend him highly. We learned a lot, were very comfortable, our requests were asked and answered, and we had a great time! Alejandro has historical knowledge of the place. He is accommodating, friendly, and has a pleasant persona. He was our guide and driver. He drove us safely while also giving us a solid tour of the place. He took us to the most delicious restaurant for lunch with the best Sangria. I highly recommend Alejandro to anyone. Thanks Alejandro for a fun and memorable experience of Cabo San Lucas and San Jose. TOUR GUIDE RESPONSE: Dear Edna, Thank you so much for your kindly comments. It was a pleasure to meet you and all your dearones. I look forward to see you next time. Hasta la vista amigos! alejandro was an excellent tour guide, he represented his city very well. the glass bottom boat tour was amazing and the glass factory was incredible. he took us to some fun places to shop and found us a cigar shop when he found out we were looking for one. we would definitely use him again and would highly recommend him to any one. thanks again alejandro!!!!! TOUR GUIDE RESPONSE: Dear Steven, I thank you so much for your kindly comments. It was a pleasure to serve all of you, and to know my tour met your expectations I look forward to see you soon! Alejandro knew the area and his topics well; His SUV was very nice; He was enjoyable to spend time with. All 4 of us enjoyed our tour with him. TOUR GUIDE RESPONSE: Dear Terry, I really appreciate your comments. It was a pleasure to me spend time with all of you. I hope to have the opportunity to attend you again. Hasta la vista amigos! Alejandro was excellent, very knowledgeable and considerate. We had a great time in Cabo and saw many things off the beaten path. Never having been to Cabo San Lucas before we feel like we had a great tour which exposed us to the the neat aspects of the region's geography and culture. Alejandro was very informative and we saw a great deal of the area. We never felt rushed so we got to savor each new experience. Would certainly recommend this tour to others. TOUR GUIDE RESPONSE: Dear Frazee, I thank you very much for your comments and to know that you enjoyed my Tour. I hope to have the opportunity to serve you on another occasion. ¡See you soon! Alejandro did an excellent job for the 2 of us. We wanted a customized tour that did not do just the usual touristy things. Further, we did not have a lot of time in port and had certain must-see things. He managed perfectly. He was friendly and knowledgeable about most things. His arrangement of a private glass-bottom boat was especially appreciated. Alejandro was very informative and very flexible with his schedule. He tailored the tour to our needs and wants and never made us feel that we were required to follow his own personal agenda. We never felt rushed and the time he had allowed for each stop on the tour was perfect. He was able to answer all of our questions without a problem. We all really enjoyed our day with Alejandro and would highly recommend his tour. TOUR GUIDE RESPONSE: Dear Paul, I thank you very much for your comments about my tour. I look forward to seeing you and friends some other time. Ciao my friends ! TOUR GUIDE RESPONSE: Dear Howard, I really appreciate your comments. I hope to have the oportunity to serve you in other ocacion. Have a Nice trip! I highly recommend this tour and our guide Alejandro. I would do this tour again and it was a perfect way to see the sites and experience the area! I would give this 6 stars if was available! TOUR GUIDE RESPONSE: Thank you so much for your comments dear Mr Cortney and beautiful family, I really appreciate it. I hope as well to have the opportunity to serve you again. Pleased to meet you. Hasta la vista amigos! Alejandro was a great guide. He took us to some awesome places. He is very knowledgeable about the area. We ate at a fabulous restaurant for lunch in Todos Santos. Alejandro is very flexible and let us decide where we wanted to go and what we wanted to do. Hope to come back again someday! TOUR GUIDE RESPONSE: I appreciate too much your comments. I hope you and family come back soon. Hasta pronto dear friends. The tour was amazing. The service provided by our Host, Alejandro, was excellent. Alejandro truly engaged himself into giving us top quality and service, not to mention, how informative he is when it comes to any subject or matter pertaining to this area of Mexico. Job Well-Done Alejandro. Keep it up. TOUR GUIDE RESPONSE: Thank you very much Ms Magdalena..I really appreciate your comments. 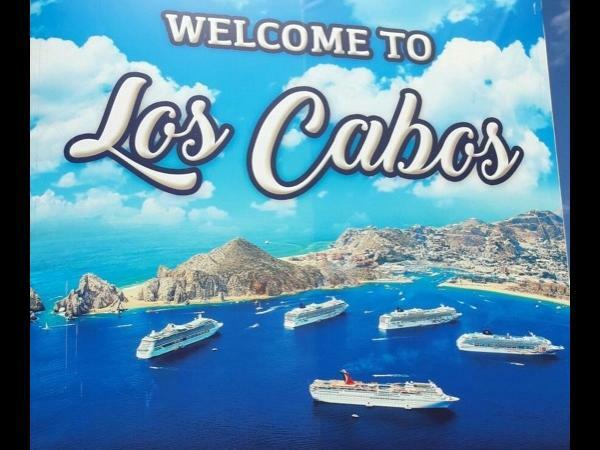 I rejoice that you got to know the most interesting places of this 'amazing Cabo' So now your family have become a Caboholics..it's very addictive. So you soon amigos ! Absolutely wonderful experience. Alejandro was amazing. We had a private tour and it was really above and beyond our expectations. He took his time explaining everything to us and really customized for our desires. We learned so much about the history and culture. Even learned a little Spanish! 5 stars isn't a high enough raiting! TOUR GUIDE RESPONSE: I really appreciate your comments so much . It was a great pleasure and opportunity for me to serve you and beyond your expectations. You should be here sooner. May be next week..lol! Hasta la vista amigos! Alejandro was very pleasant and had a nice sense of humor. he offered flexibility in our day and took us off the beaten path showing highlights and history. My Fiancé and I enjoyed our day. Lunch was great and love the private glass bottom boat tour! My fiancé loved the tequila tasting and watching the glass blowers was truly beautiful! TOUR GUIDE RESPONSE: I really appreciate your comments about my person and service. I'm glad to get you enjoyed the beauties of this wonderful place.